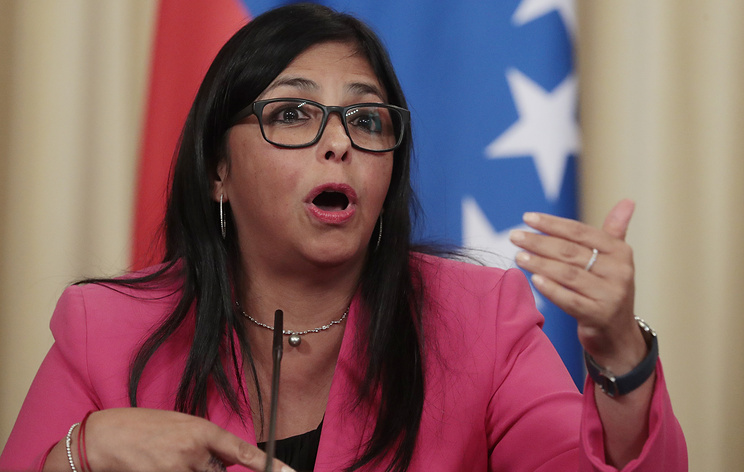 Venezuelan Vice President Delcy Rodriguez said that "US, Brazilian and Colombian officials intend to ignore the will of the Venezuelan people and launch a military intervention"
CARACAS, April 15. /TASS/. The Venezuelan authorities have accused the United States, Brazil and Colombia of preparing for a military intervention into the Bolivarian Republic. "The international community and its institutions for protecting legitimacy around the world should know that a criminal plan is in the works to stage a military attack on Venezuela," Vice President Delcy Rodriguez said on Monday. "US, Brazilian and Colombian officials intend to ignore the will of the Venezuelan people and launch a military intervention," Rodriguez added. If they decide to proceed with their plans, these countries "will commit crimes against humanity and will have to bear responsibility on the international level," she noted. On January 23 Venezuelan National Assembly Speaker Juan Guaido proclaimed himself as the country's acting president. Venezuelan President Nicolas Maduro has described it as a coup attempt and announced severing diplomatic relations with the United States. On January 28 the US imposed sancitons on Venezuela's state-owned PDVSA oil company. Guaido was recognized as interim president by the Lima Group countries (except for Mexico), as well as by Albania, Georgia, the United States, and the Organization of American States. Several EU countries came forward with support for the Venezuelan parliament and expressed hope for new elections to resolve the crisis. Maduro was supported by Russia, Bolivia, Iran, Cuba, Nicaragua, El Salvador and Turkey. Belarus and China called for resolving all issues by peaceful means and spoke against any interference from the outside. The UN secretary general called for dialogue to resolve the crisis.